The "bolero" had found its undisputed king! Indeed when the records reached the radio stations in Chile and the rest of Latin America they caused the kind of popular frenzy only associated up until then with a Frank Sinatra... Overnight Lucho Gatica had become an idol for millions of people everywhere. 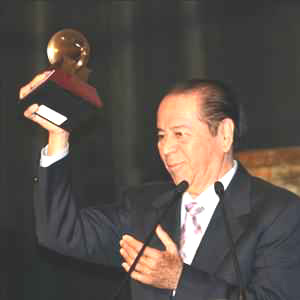 From that moment on, his influence on world music was overwhelming; vocalists of many different nationalities and languages felt Lucho's impact and have, at one time or another, sung and recorded "boleros", from Perry Como to Peggy Lee to Dionne Warwick to The Beatles; even Doris Day recorded a bolero album and Nat King Cole went further by recording in Spanish three albums which included many of Lucho's greatest hits... 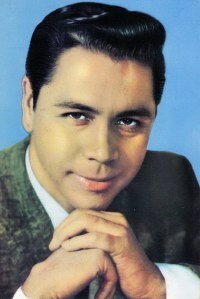 Naturally, Lucho's interpretation of the "boleros" have influenced every Hispanic vocalist since. Julio Iglesias has publicly confessed that Lucho remains his one single musical influence and calls him "The Master" while younger singers such as Mexico's mega-star Luis Miguel have both enhanced their popular appeal and careers by recording cover versions of the songs Lucho made famous... But no matter who sings his songs, critics and public consider Lucho’s interpretations alike as the definite rendering of those classic hits...impossible to top. 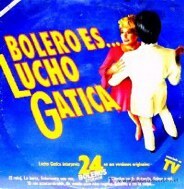 Lucho Gatica was born on August 11, 1928, in the neighborhood of Población Rubio in Rancagua, a mining town in central Chile. His parents were José Agustín Gatica and Juana Silva who had four other sons before Lucho and a daughter after him. Mr. Gatica died when Lucho was three years old and it was up to Juana to raise her six children alone and with great financial difficulties. The sons stuck to their mother and helped out. They became an indestructible clan which, in spite of the limitations, always had time to make music together and look at the future with optimism. Older brother Arturo, a powerful baritone, was the first to launch a professional singing career in their hometown. He signed a recording contract with Odeon records (now EMI) which would make him a very popular performer throughout the country cultivating mainly the Chilean folklore but later branching out to other genres. Arturo became the main breadwinner for the Gatica clan but he knew that his kid brother Lucho was also musically inclined although a bit too shy to sing in public. He encouraged him to sing duets with him and Lucho made his professional debut with Arturo at the Apolo Theater in their hometown. 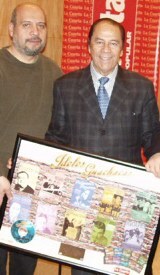 Arturo also used his influence at Odeon to procure a record contract for Lucho as a single artist. Barely out of his teens, Lucho made his first recordings consisting mainly of the same kind of folk songs his brother was famous for. The records went nowhere. Deep down the young artist was longing to sing "boleros" but his mentors at Odeon thought he was not mature enough to do justice to the steamy bolero catalog... Somehow Lucho prevailed and the now legendary record session took place in which he recorded, among others, "Contigo en la distancia", "En Nosotros" and "Sinceridad"... Lucho sang the "boleros" in a fresh new way. There was passion and there was warmth in his velvety voice. Indeed Lucho could make people "feel" the lyrics to his songs like nobody had done before...Since then, Lucho Gatica became a prolific recording artist turning out hit after hit. 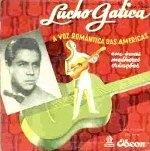 "El Reloj", "La Barca", "Novia Mia", "No Me Platiques" and forty other songs all went number one in the "hit-parades" of Latin America, Spain and Portugal breaking all previous sales records and winning for Lucho many "gold record" awards. Lucho tries to escape from the fans with a little help from the cops! Like everything the singer had "touched" before, these recordings "turned to gold". (A few years later, a rock band that called themselves The Beatles entered the same Parlophone studios in London to record their first sides, including Lucho's "Bésame Mucho". Even later, the band would have an uncontested success with the Lennon-McCartney tune "And I Love Her", whose rhythm and arrangement was clearly based in the "bolero" genre). By 1955, "Luchomania" had reached México and Cuba, the two most important Latin show business venues of that era, and from there it spread throughout the Caribbean and the rest of the American continent. Everywhere Lucho performed there was pandemonium before, during and after his concerts... 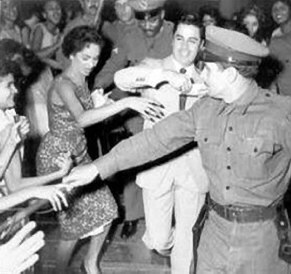 In Havana he overfilled for several weeks the enormous Blanquita Theater (at that time the second biggest theater in the continent, after Radio City Music Hall) and from there he jumped to the famous Tropicana Night Club "a paradise under the stars". It was also in Havana where he made his television debut singing his greatest hits live for viewers throughout the island. It was reported that normal Cuban life was disrupted every time Lucho appeared on the small screen. Cubans had more television sets per capita than all other Latin American country and Lucho achieved the biggest ratings in the history of that medium in the island. Everyone wanted to see and hear the "king of boleros". By the late 1950's it became a standard practice throughout Latin America to accord Lucho the same honors as a chief of state whenever he played those countries. But he could never imagine that his arrival in Spain in 1959 would also go down in history. 5,000 screaming fans were waiting for him at Madrid’s Barajas Airport. The drive, in a flashy convertible, from the airport to downtown Madrid, would attract cheering crowds on both sides of the roads, carrying flags, pictures of him and homemade welcome signs. His performances in Spain were social events which attracted royalty, politicians, movie stars and jet setters from all over Europe. One of his most devoted fans in Spain was actress Ava Gardner, and although the tabloids hinted at a possible romance between the temperamental film star and the young romantic crooner, the relationship became a solid friendship that lasted for many years. From Spain it was logical that Lucho would perform in Portugal where the public finally got the chance to see the recording personality live and in concert at the prestigious Casino de Estoril. These performances also turned into social events when all the local celebrities turned out "en masse" to applaud the charismatic singer... In spite of the efforts to keep him in the Iberian Peninsula for a longer time, Lucho left for Montecarlo after receiving a personal invitation from Her Serene Highness Grace of Monaco to perform in her annual Red Cross Benefit. At the Casino, Lucho becomes the talk of the French Riviera but he can not stay there much longer since more recordings and more concerts waited in America. By this time Lucho had sold over 22 million records worldwide and his success was making quite a lot of noise in the United States. 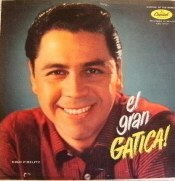 Capitol Records was releasing his albums for the English-speaking market, including titles such as "Lucho Gatica Sings," "South American Favorites," "Lucho in Mexico," "Mucho Lucho," etc. After visiting Manila, Philippines in 1962 where Lucho performed at the impressive Araneta Coliseum in front of 160,000 fans, his next gig was none other than at New York's prestigious Carnegie Hall where his shows sold out as soon as the tickets went on sale. 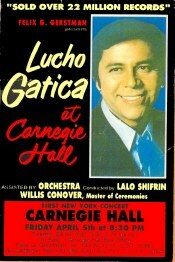 At Carnegie Hall Lucho performed with a symphonic orchestra conducted by Lalo Schifrin and the opening night show was broadcast live by radio to his native country. Every night, at Carnegie, Lucho was introduced by Jazz critic Willis Conover who became one of his biggest boosters in the U.S. In New York he was also asked to perform on the Ed Sullivan Show, the most popular television program in the country. With Carnegie applause still ringing in his ears, Lucho traveled to California where his friend Nat "King" Cole awaited. Both singers had met previously in a Havana recording studio and Lucho had introduced Cole at the Tropicana. 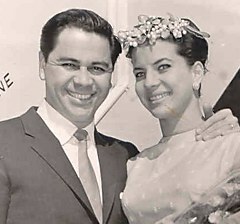 Now the American singer was reciprocating by introducing Lucho at the Hollywood Bowl, cementing a long friendship and mutual admiration that lasted until Cole's early demise in 1965. 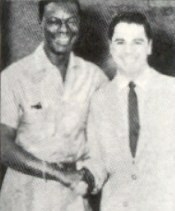 Nat "King" Cole & Lucho...friends forever! 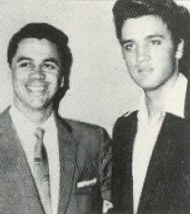 Lucho's success at the Bowl was "the event" of that season in the capital of world entertainment and it was around this time that Lucho met Elvis Presley. This unique encounter of the "two kings of music" was publicized all over the world. 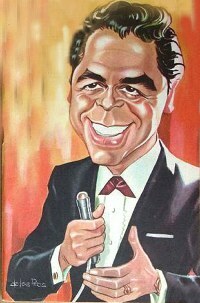 It was also at this time that Lucho became a much sought-after celebrity for the television industry, appearing in the shows of Dinah Shore, Perry Como and Patti Page to mention just a few. During this Hollywood sting Lucho recorded for Capitol several sides in English with Nelson Riddle and his Orchestra, which are considered classics by record collectors everywhere. This revalidation of Lucho's legacy has also maintained the singer touring constantly in recent times. 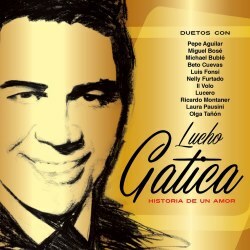 In 1996, HBO produced a spectacular tribute to Lucho Gatica taped live at the James Knight Center in Miami with the participation of many artists, including Julio Iglesias, Celia Cruz, Luis Miguel, Juan Gabriel et all. Lucho sang duets with some of the celebrities in attendance and the show was broadcast by HBO as a two-hour special to enormous critical and public acclaim worldwide. had represented Puerto Rico in the 1957 Miss Universe Pageant. They seemed the perfect couple and the marriage was blessed with a large offspring: Luis, Maria del Pilar, Aida Yolanda, Juana Silvia and Alfredo Fernando. However, it all ended in a "friendly divorce" and Lucho would remarry twice. The next Mrs. Gatica was Diane Lane Schmidt, an American lady with whom he had a short-lived romance and marriage. However the couple produced a daughter named Luchana, whose godfather is none other than Julio Iglesias. Later Lucho settled in California where he met his current wife, the beautiful Leslie Deeb and with whom he had still another daughter named Lily Teresa. Of all the Gatica children, only Luis, Luchana and, lately, Lily Teresa showed interest in show business. Luis is now a successful television, stage and film actor in Mexico while Luchana is a promising film starlet in Hollywood and Lily Teresa is starting out as a standup comedian. 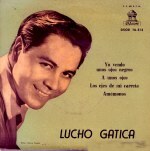 During his lengthy career, Lucho Gatica has received the most important awards in all the countries in which he has performed. It is impossible to list them all in this limited space but Lute is particularly fond of the proclamation in his hometown of Rancagua, Chile which names him "favorite son" of the village. He is also very proud of the Medal of Congress given to him in Ecuador and the Holy Cross of Triana de O'Higgins, the highest honor that Chile grants on its outstanding citizens. In 1992 he was awarded the "Gaviota de Oro" at the internationally famous "Viña del Mar Festival", the only solid gold trophy granted so far at this annual event. In April of 2000 he received at New York's Lincoln Center the life achievement award from A.C.E. (Association of Show Business Critics). To wrap up this brief list it must be mentioned that in 2007 Lucho received another Platinum record and the Gold Medal of the Chilean Society of Composers presented to him by the President of Chile, Michelle Bachelet. This award proclaims him "a fundamental artist in Chilean history." Also of extraordinary importance are the recognitions granted to Lucho in 2008 in the United States. A "life achievement" Latin Grammy presented to the singer in Las Vegas for the everlasting popularity of his recordings and the unveiling of a Lucho Gatica "star" in the legendary Hollywood Walk of Fame which grants his immortality among the greatest artists of all time. 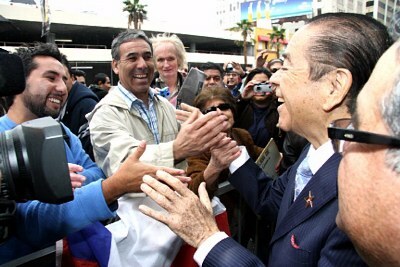 Lucho and Leslie Gatica share a magical moment at the Walk of Fame ceremony in Hollywood. One of Lucho's greatest satisfactions was when young couples approached him to tell him how they fell in love while listening to one of his songs. Older couples also approached him frequently, often with sons, daughters and even grandchildren in tow. No formal introductions are needed; they see Lucho as a lifelong friend and confide in him: "This is our son conceived while listening to your records". More than half a century singing about love and enchanting audiences everywhere might have given the impression that the vocalist was eternal. There was shock and deep sadness when, on November 13, 2018, the world received the incredible news that the beloved Mr. Gatica had died in his home in Mexico City. In spite of his passing, the public's love affair with Lucho Gatica has never ended. He was and is the "King" and audiences never tired of listening to his records which are constantly rereleased to keep up with the great demand. Lucho once said to a magazine reporter that "as long as people fall in love my songs will be popular". Time has proven him right without a doubt. The sensational 2013 Duets CD..!